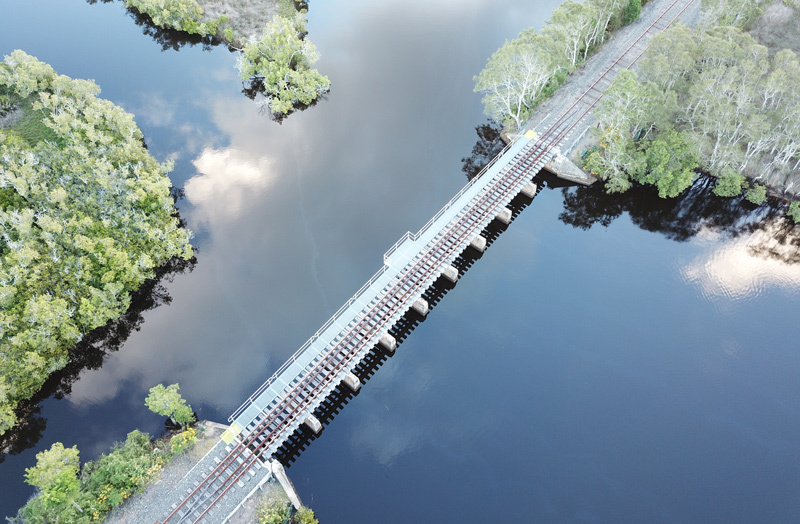 Byron Bay Railroad Company has restored a derelict heritage train, repaired three kilometres of railway line and a bridge and reinvigorated and consequently preserved a section of an out of action rail corridor to provide a heritage rail service linking two key Byron Bay centres. 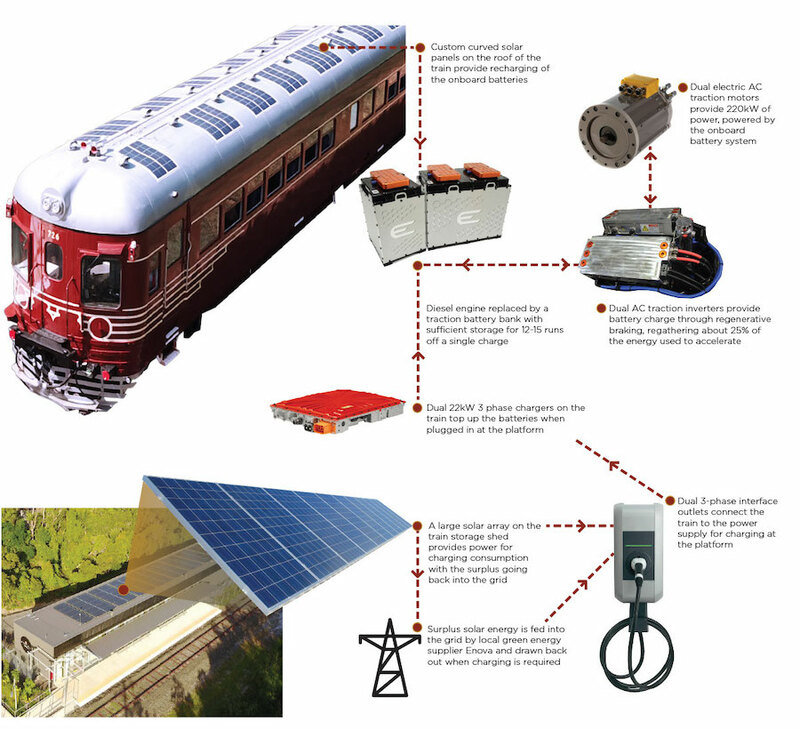 The train operates on energy from the sun. Solar panels on the train and train storage shed over a twelve month period generate the equivalent amount of energy required to operate the train daily plus power 17.5 three person homes for a year. This is a world-first truly solar train and BBRC is proud to bring this technology and solution to Byron Bay. Byron Bay Railroad Company was awarded the 2018 Rail Sustainability award at the Australasian Rail Association Awards. This is in recognition of the work done to re-use infrastructure and rolling stock and to bring to life the world’s first solar-powered conventional train. One of the two diesel engines has been removed and replaced with a pair of electric traction motors and associated traction inverters and equipment and a Lithium-ion battery bank. Special curved solar panels have been fitted to the roof of both carriages which between them collect and generate up to 6.5kW of solar power to charge the train’s batteries. There is also a large array of solar PV panels on the train storage shed roof capable of producing up to a further 30kW which can be connected by cables to top up the train’s batteries. The train is also equipped with a regenerative braking system that turns the traction motors into generators during braking to recharge the batteries. All the equipment on the train is powered from the Lithium-ion batteries including traction power, lighting, air compressors and control circuits. To reduce electrical consumption all lighting has been replaced with LED’s. The considerable surplus electricity generated from the train shed roof solar PV panels is exported to the electricity grid and on heavily overcast days or for night time operations the train’s batteries can be charged from the grid if required, using only renewable energy from the local supplier. Byron Bay Railroad Company are proudly working with the following partners, experts and suppliers to deliver the solar conversion project. Our train has been modified to have a single Cummins 14 litre NT855 diesel engine, which is renowned within the industry as a clean-burning engine. One of the two diesel engines has been removed and the other remains on board for weight and balance and also to provide an emergency back up in case of an electrical fault. The remaining diesel engine is not required for normal operation, even in cases of prolonged lack of sunshine. 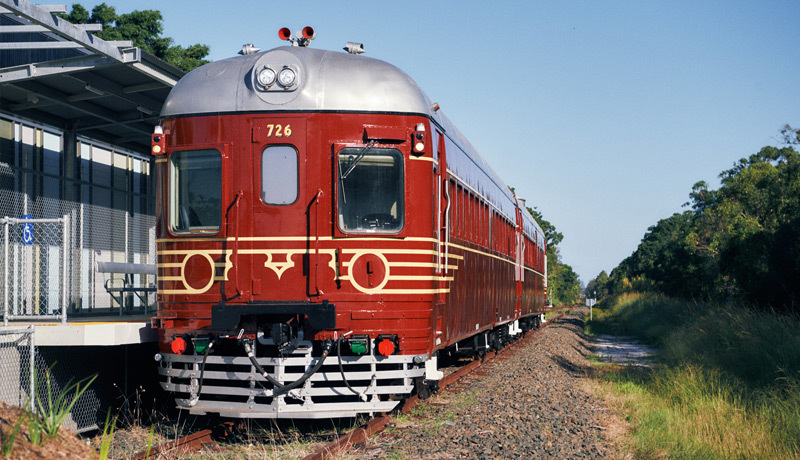 “They are and always have been one of the cleanest burning and fuel efficient diesel engines, which is one of the main reasons why the NSW Government, at great cost to the public purse, replaced all the Detroit and Rolls Royce engines with Cummins on all diesel railcars”. Whilst Ewingsdale Road experiences traffic gridlock, the 126 year old, 40 metre wide rail corridor running parallel to the Byron coast lay fallow for 13 years. BBRC revitalised this historically significant railway line, making it once again an important transport corridor. With the assistance of Lithgow State Mine Railway and Lithgow Railway Workshop, BBRC fully restored to operating condition a 1949 heritage rail car that had been out of action for twenty-five years, bringing it back to life. A slightly newer 1962 heritage railcar that had only been out of service for 10 years has also been restored to work as a two car set. In addition BBRC restored the state owned railway infrastructure and bridge to once again safely carry passenger trains.